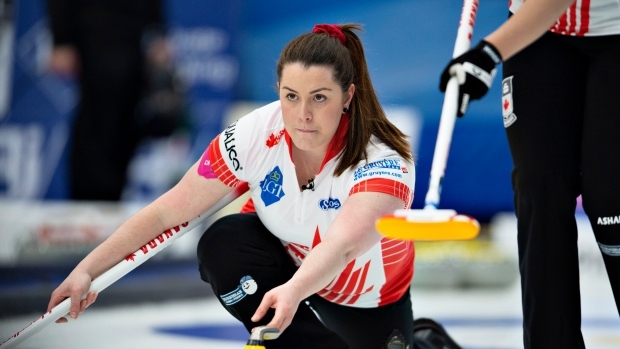 SILKEBORG, Denmark — Canada's Chelsea Carey recovered from a loss to Japan to post a 7-6 win over Finland on Monday at the world women's curling championships. Carey's Calgary-based rink scored two in the eighth end to take a 7-3 lead. But the winless Finns made it close with two in the ninth and a steal of one in the 10th. Canada improved to 3-2 with the late win, good for a tie for fifth with Japan and Scotland. The top six teams after the round-robin make the playoffs. Carey said she was pleased with her team's ability to rebound after losing their earlier game. "You don't want to lose many games at all, but certainly two in a row, it just puts you on a downward spiral that's hard to come back from," said Carey. "Especially considering we already lost two, we needed to bounce back tonight, and we did that. Now, we need to keep that going moving forward, but tonight was what we needed to do." Against Finland, Canada scored one in the first and then stole a point in the second thanks to a precise hit-and-roll on Carey's final stone. The Canadians stretched the lead with a deuce in the fourth. "Experiencing it is different — feeling that pressure," said second Dana Ferguson. "There's a lot of things said (by fans), negative and positive, and even though you try to shut them out, you still kind of hear it in the back of your head after every loss. I think it's just a different feeling. You're not just representing you, you're representing your country and it's a different feeling than I've ever had. "But we're all getting more comfortable with it." Carey said her team is also getting more comfortable with the ice. "The ice was really nice today, and the lack of rain is probably helping," said Carey. "We just didn't feel like we were guessing as much today. The speed was pretty predictable, the line was pretty predictable, so we were better with sweeping, judgment, me putting the broom in the right place, all that stuff, because the ice was more predictable." Also Monday, China downed host Denmark 8-4 to improve to 5-0. The Danes fell to 0-5 along with Finland and Latvia. Russia (4-1) moved into a tie for second with idle Sweden with an 8-7 win over the United States (2-3). South Korea was in fourth at 3-1. Scotland scored two in the 10th end for a 5-4 win over Latvia in the other Draw 8 match. Canada started the day with a 7-5 loss to Japan, Seina Nakajima's rink took control with a deuce in the ninth to take a three-point edge. The Canadian rink features Carey, Ferguson, third Sarah Wilkes, lead Rachel Brown and alternate Jill Officer.